Have you ever opened a seed packet with seeds so tiny you wonder if they really are seeds? It’s those incredibly small seeds—including carrots, poppies, and lobelia—that can slip from our fingers, or wash away when watered, that require special care. The tips show several ways to sow tiny seeds right where you want them and ensure better germination rates. For the basics on indoor seed starting, see Seed Sowing 101. As you get into starting plants from seed, it is intriguing to see all the seed variations. Size, colours, textures, shapes, seed coats—it’s always a surprise for new gardeners. Simple, large seeds like peas and beans are so easy to manage. The tiny seeds are the ones that need extra care to avoid waste or loss. One sneeze and you can send a whole row of future carrots flying. Too much water and your future poppies sail away. Dispense too many in one spot, and you’ve got lobelia fighting for root space. Due to their size, tiny seeds have several disadvantages: lower food stores to nourish the early growth process, greater vulnerability to cold and damp conditions, and lower germination rates. They don’t stay viable in storage the way larger, tougher seeds can, so the sooner we sow them, the better they fare. Before anything else, read your seed packet. 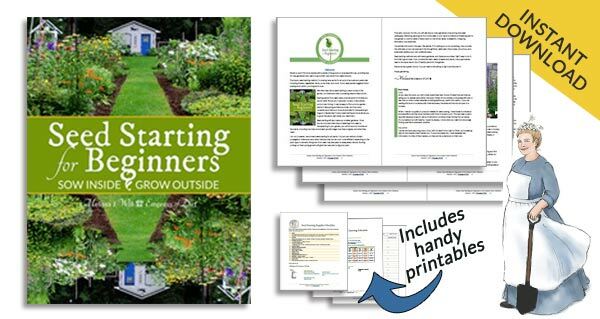 They often include tips for success regarding sowing conditions, depth to sow the seeds, best timing, and how long you will need for the seed to mature. Each plant species also has a sweet spot for the best soil temperature for germination. I’ve listed the best temperatures for many common plants here. Most tiny seeds are ‘surface sown’ meaning they are placed on top of the growing medium or soil and then covered with a very thin layer of soil, sand, or vermiculite—just enough to keep them in place, in darkness, until the sprout. I prefer to moisten the soil before sowing so the seeds will stay where I put them. If you water afterwards, do not water from overhead, or the seeds may wash away. Fill an empty salt shaker with fine sand. Add the quantity of seeds you wish to sow. Shake to combine. Sprinkle the seeds in your sowing area. Another version of this tip is to use any little jar with a lid with holes in it or a match box, where you can sprinkle the sand/seed mixture into your prepared sowing area. 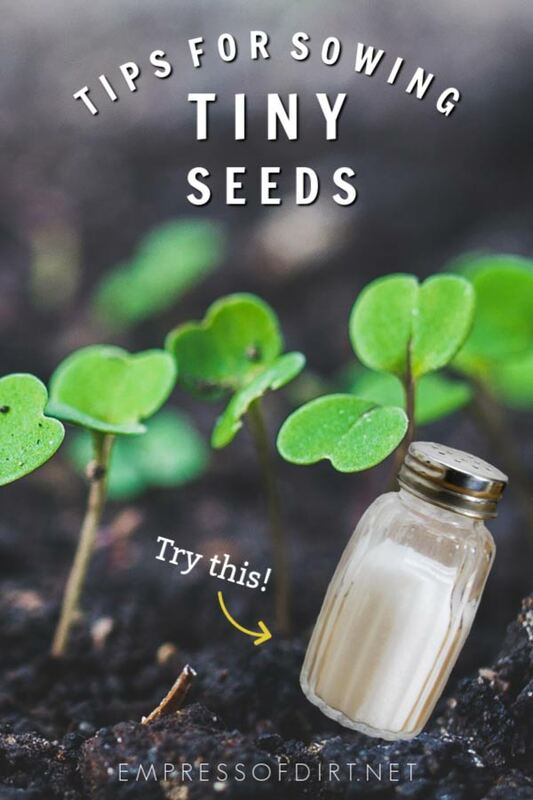 The super simple version is: get a handful of clean sand, add your seeds, cup your hands to combine, and sow by sprinkling into the garden as desired. Or, use a small paper cup. Add the sand and seeds, shake to combine, form a spout by bending the lip of the cup, and tap the mixture into the soil. Buy or make seed tapes. Seeds are glued to pieces of tissue or paper at the correct spacing for sowing. I have instructions here for making your own seed tapes. Planted in the soil, seed tapes gradually break down (and vanish), leaving the seeds to sprout. I know some gardeners find making seed tapes way too fussy, preferring to over-sow and remove excess seedlings later, but I find it worthwhile. My garden is very sandy and seeds wash away if it rains before germination. I am also a seed-thinning klutz: better to sow carefully first than mess things up later. A slightly damp toothpick or other fine dibber can easily pick up fine seeds. Use a second toothpick or dibber to push the seed off, onto the soil. Again, it’s slow, fussy work but suits those of us who don’t mind working this way. Personally, I prefer this to using a greater quantity of seeds and thinning them out later. The syringe style is another option. I haven’t tried this type so I’m not sure how well they work. Tiny seeds benefit from extra care to ensure good germination rates. Always read your seed packets for sowing tips. Options for controlled sowing include use of a salt shaker with sand, seed tapes, damp dibbers, or a seed dispensing tool. Soil temps are so important and little creatures who eat seeds. And not all seeds are created equal.